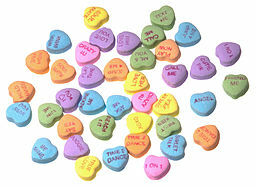 Unfortunately, unlike Earth Day or President’s Day, Valentine’s Day can be a little hard to navigate. Don’t you worry your pretty little head. I’ve got your back. 1) Hide behind a corner and jump out at them when they walk by, roaring something like “DATE ME!” as loud as you possibly can. It’s endearing, and you get to see how they react in life-or-death situations. You also might be able to see how hard they can punch. 2) Rent space on a billboard and write something like, “Dear Super Interesting Person with the Cool Hair [You should probably use their name, actually], Dinner? Sincerely, Another Interesting Person with OK Hair [That’s where your name goes].” Put your phone number beneath it. The best part of this plan is that you’ll probably get A LOT of blind dates even if that particular date doesn’t work out. Sure, some of them may try to rob and kill you, but they could also be your soul mate. Your thieving, murderous soul mate. 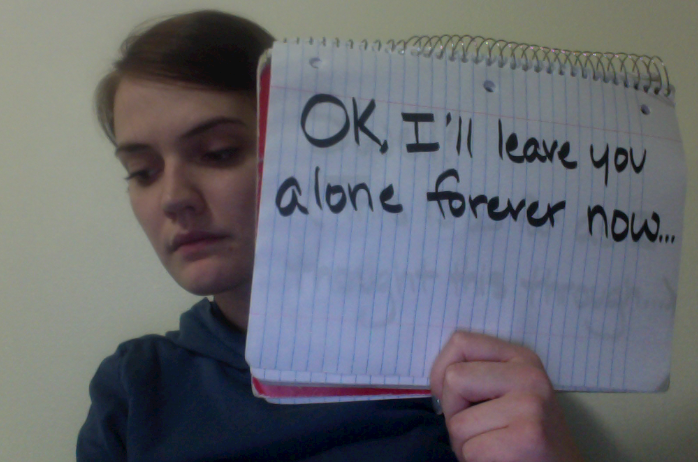 3) Make a sign and stand outside the Super Interesting Person with the Cool Hair’s window with it. It’s very important to try to do this at the least-scary time possible. For example, a good time would be when they’re starring in a movie and staring wistfully out a window. A bad time would be in the night, after you’ve been breathing heavily on the glass for some time. You may want to have a sign ready in case of rejection. Roses are red, these plums are purple. If you want to make out, I’ll try not to slurple. 1) Puppies! People love puppies! 3) …I don’t know. I’m not the one dating them. Do I have to do everything around here? 1) Get another, more interesting date with even cooler hair. Forget about the first person. Their hair wasn’t cool enough for you and you know it. 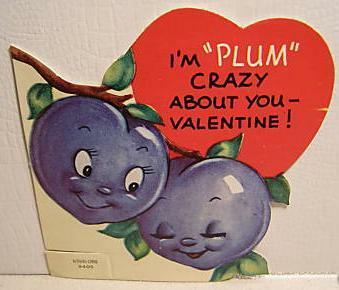 2) Realize that Valentine’s Day is a silly holiday. Everyone knows Columbus Day dates are much more romantic, which means you have nothing to worry about until October. 3) I made you a valentine. So cute! I wish I knew a really interesting person with really cool hair just so I could give them potatoes! Shame, guilt, and love–sort of a club sandwich mix of emotions. Excellent. The best part is that it comes with a frilly toothpick. For years I have racked my brain to find a way to figure out at the very start of a relationship how the person reacts in life-or-death situations and how hard they can punch. Brilliant. I’m suddenly hungry for hash browns. This is one of the most effective methods for discovering that information. Other ways include hiring someone to “mug” you two and actually getting mugged. Hash browns sound AWESOME. Love it. I am so grateful that I am no longer on the dating circuit (married 25+ years, but I certainly remember how gut wrenching and all consuming it can be. Hahaha. There are really no downsides to this strategy! Hershey’s kisses: saving face and blood sugar levels since 1907. If someone were to tell me I was awesome on Arbor day by giving me a Japanese maple or something, I would be totally into them. Japanese maples are expensive. Let’s start that tradition. We’ll buy the people we’re fond of trees on Arbor Day and small planets on Earth Day. I think we’re onto something here. I totally want to give you some chalky blog lovin’. Or a puppy. That Valentine was amazing. I WOULD LOVE A PUPPY. I will hide it in my apartment and no one will ever know and I will feed it and take it on walks and be so, so, so, so nice to it. …I apologize. Apparently I’m a four-year-old. Thanks! I’m thinking of starting a love advice column. I’ll call it “EVERYONE DIES ALONE” and it will be incredibly depressing. Of course no one will publish it, so I’ll just read it aloud to my 30 cats. Cool Hair Guys are out there, I’m told. Maybe check behind and under things? Thanks for reading! Oh! And love your infograph! So much that I linked to it from my recent post. Write on! The ellipses of hope. Hope that guilt will change your mind! The ellipses of hope sounds like a band full of sad grammarians. I would go to their show. Unfortunately, I tried to say something to someone on Yom Kippur. Bad timing on my part? Oof. Yom Kippur is the most rejection-y of holidays. April 1 is the best day to tell people how you feel because if they don’t react well you can just yell, “APRIL FOOLS!” and things get (slightly) less awkward. I like your thinking on this. I should try that. You crack me up. I once gave my Valentine a potato with lovey messages written all over it in Sharpie, but his mother threw it away when they eyes started growing. That’s the cutest thing I’ve ever heard. Parents, man. They just don’t understand. Very informative (and hilarious) as usual. Potatoes may be the perfect gift! Don’t like baked? Try mashed. No? Have a french fry. And your ways to get someone to kiss you are genius. Which one have you found to be the most successful? I actually chickened out before trying any of them. Instead I just went for it. I said, “I’m pretty cool” and walked away. It was embarrassingly ’80s movie-esque. Your list made me think of that. That is wonderful, and I would give that to so many people. (I’m currently stalking, like, 30.) I hope there’s a card store somewhere that just sells socially unacceptable cards for people like me. You mind works in very weird, yet strangely compelling, ways! Love the jumping out and getting puched! Luckily I am married, unluckily, he doesn’t have cool hair (although don’t tell him that – he thinks long, unstyled hair at 50 is cool!). Ha. I’m glad that if I had to have a weird brain, it’s at least strangely compelling. Long, unstyled hair at 50 can be cool… depending on his profession. Is he an aging rock star? Then it’s totally cool. I’ve never been a big fan of the holiday, but you may have just converted me with this blog! Besides, V-day is a great time for artists and illustrators (like me?) to show off with a hand-made card. I like the question mark in that parenthetical statement, like maybe you’re not sure if you’re an artist or illustrator. Hand-made cards are THE BEST. I think you could have the whole holiday on lock. You are hilarious. How are you not famous or rich yet? Or are you? Can I have a boat? Ha. I am not even a little rich or famous, but I’m going to use the power of positive thinking to get you a boat if it’s the last thing I do. Stephany, I read your valentine attachment and was amazed & impressed by your analysis of “love.” You’re like me in the way you analyze and deconstruct the behavioral reality of human emotions. The hormones and neurotransmitters you mention are part of Behavioral Neuroscience, which must be something you’re studying in college. There was a related article about the same idea, “The Sciene of Love,” in the Feb 12th edition of Parade magazine. Finally, based on what I’ve read, you may have a career in journalism, ala a Dave Barry. You’ve certaintly got a growing audience for your blog!! Thank you! I’m going to read that Parade article! I’m actually not studying any behavioral science in school… I just really like science. I am, however, studying communications, which means I get to make a lot of infographics like that one. I’d love to work in journalism someday, a la anyone who gets paid to write things. Here’s hoping! Awesome. Simply awesome. Thank you.